With a fair amount of glee, we bring you Franklin Habit. 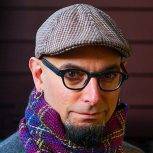 He will report regularly on books of note, bringing his wide-ranging taste and boundless curiosity in an intrepid quest for what’s new and good. Or old and good. With Franklin, you never know. We can’t wait to see what he finds next. Debbie Zawinski’s In the Footsteps of Sheep should, by rights, be completely insufferable. In her early sixties, Zawinski set out from her home near Edinburgh determined to realize a dream. She would travel the length and breadth of Scotland, visiting every native Scottish sheep breed in its original habitat. She would cover as much ground as possible on foot, sleeping for the most part in a tent carried on her back. She would gather loose fleece (“henty lags” or “henty leggits” in Shetland parlance) from each breed, spinning it on a spinning stick as she walked. She would knit this handspun yarn into a pair of socks, striped in the natural colors of Scottish wool. And you thought waiting in line for the restrooms at Rhinebeck was an adventure. This could be fertile ground for the sentimental faux-philosophizing and twee rhapsody that too often infect writing about the fiber arts; yet Zawinski avoids false steps as nimbly as a sheep on Boreray Isle negotiating a seaside cliff. 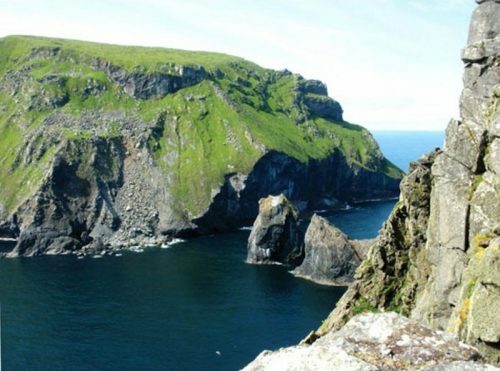 The circuit takes in ten breeds: the Shetland, the Scottish Blackface, the Hebridean, the Boreray, the Soay, the North Country Cheviot, the North Ronaldsay, the Castlemilk Moorit, the Bowmont, and the Cheviot. (The two Cheviots, despite the name and a common ancestry, are considered entirely separate breeds.) The watery, hilly geography of Scotland compels her to travel by foot, bus, rail, boat, and the occasional lift from a kindly driver. 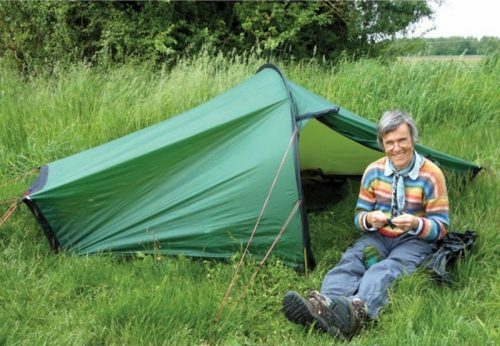 In between, she pitches her tent on whatever patch of ground seems most promising. Too large a dose of this could become tiresome. But the overall tone is bracing and forthright; she never over-sugars the mixture. The socks knit from fleece gathered on the journey are proudly displayed at the end of the book—which is lavishly illustrated with her own color photographs, sketches, and hand-drawn maps. 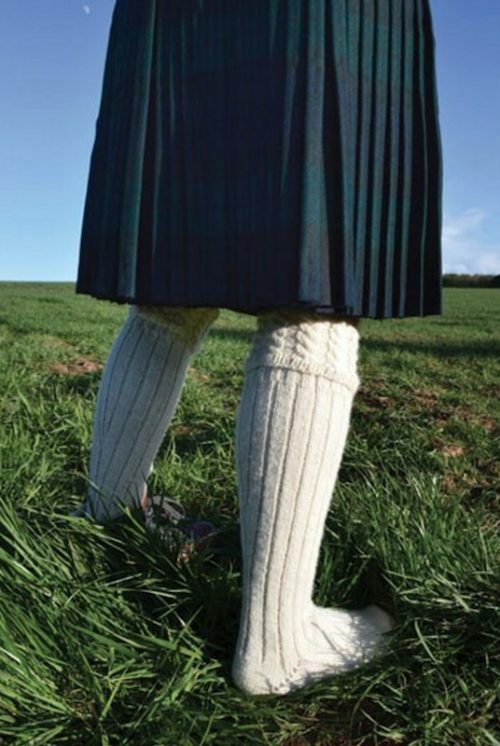 If you would like to follow in her footsteps (without the midges and cows) there’s a pattern for the “Scottish Sheep” socks, too—along with the patterns for ten pairs of socks she designed and knit as gifts for those who helped her along the way. 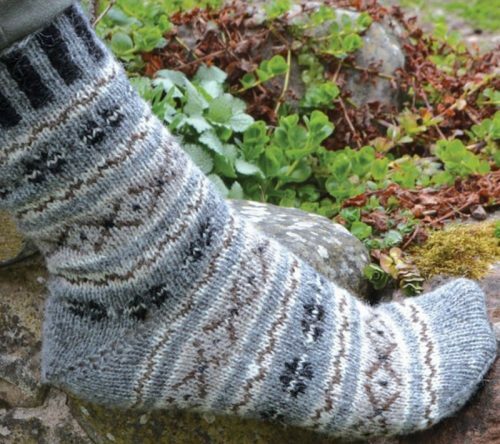 These are pleasantly varied, from cables and colorwork to a cute flock of intarsia sheep gamboling around the leg. 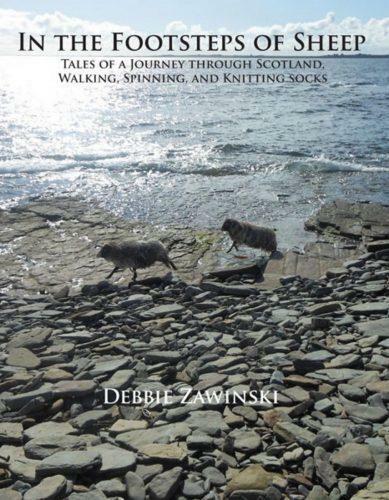 In the Footsteps of Sheep: Tales of a Journey through Scotland, Walking, Spinning, and Knitting Socks by Debbie Zawinski. 191 pages, softcover. Published by and available from Schoolhouse Press. I’m ordering it now! Thanks, Franklin. Thank you Franklin! I must add this book to my queue. Looking forward to reading more of your column. Thanks for your review–I needed it! I bought the book a while back but have been unable to read it because I’m so jealous of the author and her wonderful hiking and knitting adventure. Maybe now I can knuckle down to it. I adore this book and agree with every word you wrote about it! Great review. I’m so glad that you chose to review this book. I’ve hemmed and hawed about ordering (Oh, the temptation! ), but now I’m convinced that it needs to come and live on my shelf. Wonderful review, Franklin. Put this book on my must-read list. Yay Franklin. I got a book autographed in cambridge a year ago. I still intend to knit VitaMarie. A wonderfully written review Franklin. Sheep (well and wool/yarn too) inspired a 3-week UK trip that focused mostly on Scotland. We however took the B&B route as I don’t have the camping gene. The closest we got to camping was sleeping on the banquets in the dining area on the 13-hour ferry to the Shetland islands. While the ferry journey was not pleasant, Shetland and the Shetlanders were beautiful. The vacation left me with a deep love for Scotland and the people. I CAN’T wait to buy and read this book and to learn about Debbie Zawanski’s journey. Wow! I’m sure I never would have found this book, but now I can’t wait to read it! Thank you Franklin! Can’t wait to get my copy!! Available as streaming audio too ! Excellent. I love a chatty knitters’ book as much as i love a chatty cookbook . Franklin, I love your writing! Sounds worth reading!! Can you get it at the library? Wonderful review. Thank you for bringing this book to my attention. I’m going to invest in a copy of my own. Thanks again and keep the reviews coming! Can you share the pumpkin mug cake recipe? Sounds great to go with the book. Great job on the review, Franklin. Perfect blog to read over coffee and a pumpkin cake in a mug on a cool autumn morning. Thank you! What a great idea. Introducing Books. You are perfect for this. 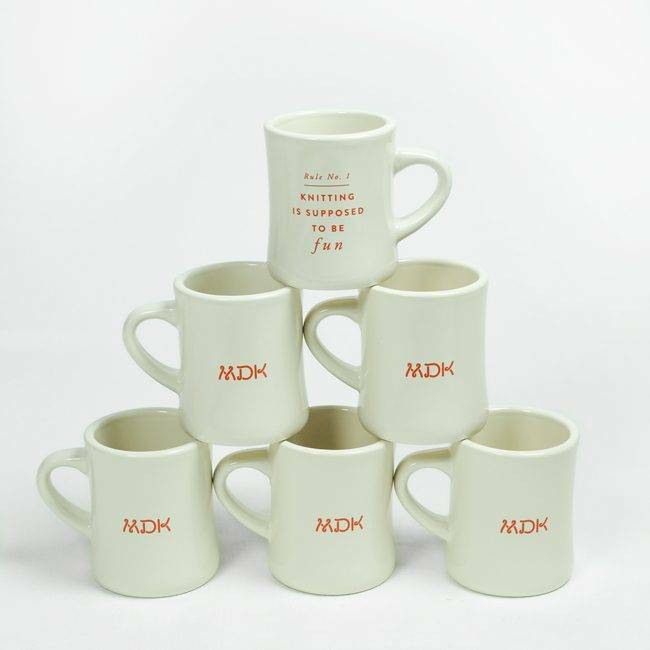 MDK, thank you for this new forum. Franklin, you are so bad for my budget. Geez!! Another book for the library. Dreaming of a mini-skein set for those socks! I think this shall be my birthday present to myself this year. It sounds lovely! Opinions aboutbooks from one of my favorite writers? I’m in and now I need to read this book. Whether or not I read this book, I loved reading the review. I look forward to this new column! I am thrilled to see Franklin writing book reviews for MDK! What a great idea. Love you Franklin….and I was not disappointed in your book review. I want to run out and purchase the book! I read this book a few months ago and thoroughly enjoyed it. Wonderfully descriptive and informative and friendly. This book actually inspired my decision to make my first foray into spinning with a drop spindle just this month, which I’m also enjoying. I figured if she could do it while walking through the countryside and camping under the stars, maybe I could make some yarn, too! She got to be one of the herd, circling around her like that! I’m jealous. Thanks for the great review…I’ll be wanting that book just for the kilt hose. Your writing is as economical and lyrical as the pieces you quote, interspersed with flashes of wry humour. I look forward to further installments. Now off to find the book! What a wonderful group you have gathered together. Information, Support, Answers and Inspiration Galore. Thank you. Great review of a fascinating book! So glad that Franklin is part of the new MDK team! Happy to see you back again!! I attended a talk given by Debbie earlier this year, in Edinburgh It was absolutely fascinating! Thanks Franklin and MDK. I really loved this book. Nice, putting this book on my list! A few years ago shortly after I opened my shop in Dublin, a Scottish lady visited the shop and we had a great chat. She told me she was going to travel around Scotland on foot, sleeping in a tent, and gathering wool wherever she went – she was going to spin the wool and knit socks! I forgot all about it until about 2 years later a girl called Iona visited the shop with a signed copy of “In the Footsteps of Sheep” for me! !